Patented by Gustaf A.Johnson on Jan.13th, 1931 (#1,789,178), this unusual side-mount reel is quite a bit different than the first reel patented by Mr. Johnson (#1,168,307) in 1916¹. Johnson, a Swedish citizen living in Springfield MA, applied for his patent on Nov. 4th, 1926, and it would appear based on all known examples that he contracted the Square Stamping Company out of Barneveld NY, just North of Utica in Upstate NY, to build his reels. Company history shows they have been in business since 1926, and to date I don't know how long they produced this reel, nor have I found any advertisments for one. 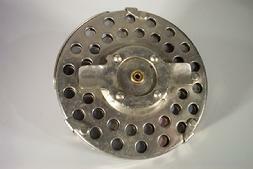 I've heard rumors of an 80 yard version of this reel, but have not found anyone that's actually seen one. 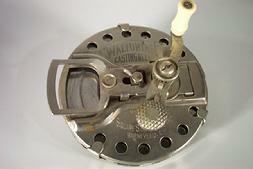 All the examples that I know of are marked "The Waltonian Casting Reel" - Square Stamping Co., Barneveld, NY - 100 yards. What I have found is that it's common to find these reels missing the tiny knurled club like click switch that rests just below the handle collar. And, even if you have that little switch, it might not make the click work, as it's a complicated device, and not very robust. Aside from these minor pitfalls, it's still a terrific and odd looking reel. I'd welcome any information on these reels, and am always on the lookout for any ads, or the elusive 80 yard model. ¹many thanks to Mr. Steve Vernon for pointing out my error in listing the incorrect patent. The correct information is now displayed!